The collection contains a nice range of crests of sporting clubs, mainly confined to single examples, which is probably not surprising as most of the clubs were local and would not have had the membership or business of, for example, the gentlemen's clubs. Shown here are most of those which relate to acquatic sports, but see also Royal Yacht Squadron; Yacht Clubs: Royal; and Yacht Clubs: Other. The commonest type within this group is that of the rowing club, a sport which has over recent years seen a growth of interest, partly no doubt as a result of British successes at Olympic level. The location of the Phoenix Rowing Club, founded in 1856, and represented here by the same attractive crest in two colours, is not known. The Dublin University Rowing Club was founded in 1847 by the merger of two earlier clubs; the name ceased in 1898 when in a further merger it became the Dublin University Boat Club. The Agecroft, dating from 1861, was also a successor to earlier clubs, in the Manchester and Salford area, and is based on the river Irwell. A nice period touch in the attractive crest of the Hastings Rowing Club is the straw boater topping the civic arms. 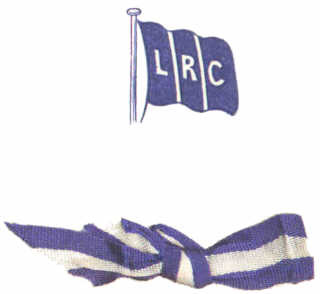 On the left is the crest and club ribbon of the London Rowing Club. The original club of that name was formed in 1870 and changed its name about 1900 to the London Bowling and Rowing Club. However, the example here is probably from the new LRC formed in 1954. Christmas cards with institutional crests and ribbons are not uncommon, they were very widely used by the army and navy, and the occasional twentieth century collections of such material which are encountered are both attractive and interesting. The letterheading for the Forth Rowing Club is from a sample sheet of addresses produced by G E Oliver of Edinburgh. The crest of the Albion Rowing Club informs us that it operated on the river Lea, but apart from a reference to it in 1870 nothing further is known of the club. The Canoe Club, on the left above, was founded by John MacGregor in 1866 and received the prefix Royal, represented by the crown in the crest on the right above, in 1874. In the centre is a crest of the Wigan Rowing Club. The Cruising Club was founded in 1880, taking the title Royal in 1902. It is still in existence with the original objectives of promoting cruising in yachts, boats and canoes on, as the crest on the right states, river, lake and sea. The Oxford University Boat Club (below) is represented in the collection by a good many examples, but no crest has been seen for its opponent in the annual Oxford-Cambridge boat race. The Exeter College Boat Club of Oxford University dates from the 1820s, The rowing was watched and supported from their barge, and presumably a club was formed for a select few who could enjoy the facility. The Royal Engineers Boat Club has not been identified with certainty but was possibly a section of their Yacht Club which was founded in 1846, and had a base on the Medway. The Brighton Sailing Club is a twentieth century foundation sailing off the beach at Brighton. The river Nith in the centre of Dumfies, Scotland, is the venue for the Nithsdale Regatta. Fishing, the sport with the greatest number of participants at the present day, is represented in the collection by only one crest, that of The Sussex Piscatorial Society.